The Super Stack 1 assembly is now complete with the mating (stacking) of the forward assembly to the fifth segment simulator. Stack one is made up of eight individual pieces: interstages 1 and 2, the frustum, the forward skirt extension, the forward skirt and the aft, center and forward segments of the fifth segment simulator. It also includes two internal elements, the roll control system and the first stage avionics module. All five super stack assemblies are now complete in High Bay 4 of the VAB and are ready for stacking on the mobile launcher platform in High Bay 3 later this month. 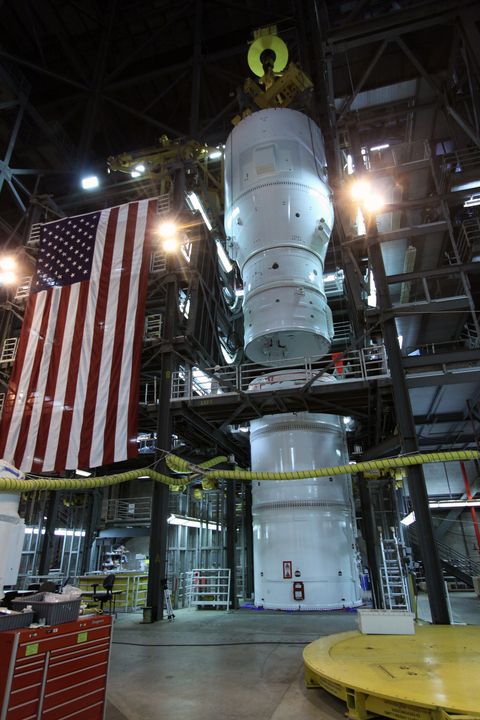 Just so you know, the reason the rocket is separated into these super stacks has to do with the height and weight of each piece for crane loads during lifting operations. Author dnkaniganPosted on July 9, 2009 March 19, 2013 Tags Aft Skirt, ares I-X, ares rocket, crew module, first stage, forward skirt, forward skirt extension, frustrum, interstage, kennedy space center, launch abort system, roll control system, super stack, tuna cans, Vehicle Assembly Building6 Comments on Supersize Me! The Ares I-X flight test vehicle is being built from a lot of off-the-shelf components, such as the solid rocket booster first stage, which is coming directly from the space shuttle inventory, or the avionics, which are from the Atlas V Evolved Expendable Launch Vehicle. However, one of the lesser-known off-the-shelf parts for Ares I-X is the Roll Control System, or RoCS. The RoCS four thrusters fire alongside the rocket in short pulses to control the vehicle’s roll. 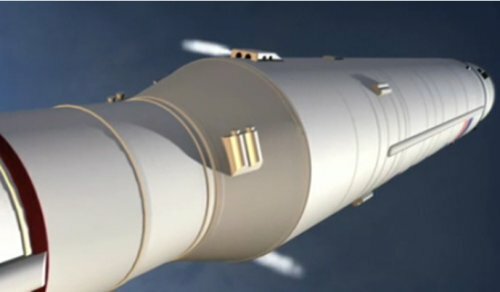 After clearing the launch tower, the Ares I-X rocket will be rolled 90 degrees to the same orientation that the Ares I rocket will use. Once that maneuver is completed, the RoCS keeps Ares I-X from rolling during flight like a corkscrew or a football spiraling downfield. This required a rocket engine that could be turned on and off like a thermostat — only when needed to maintain position within a certain range. There were actually a couple of choices: one was to use reaction control thrusters from the space shuttle. However, Ares I-X would have needed four thrusters per RoCS module — eight in all for the mission. However, with the Shuttle production lines shut down and Ares I-X being an expendable rocket, the Shuttle program couldn’t afford to part with any of their thrusters. Another option — the one eventually chosen — was the upper stage engine of the Peacekeeper missile system, which was in the process of being demilitarized and dismantled as part of the second Strategic Arms Reduction Treaty (START II). The Peacekeeper’s axial engine (or AXE) met several of the Ares I-X requirements, including the fact that it was a reliable, off-the-shelf system; it was able to handle the on/off pulsing cycle needed for the flight; its thrust was such that only two engines would be required per module; and it was relatively low-cost and available for use. 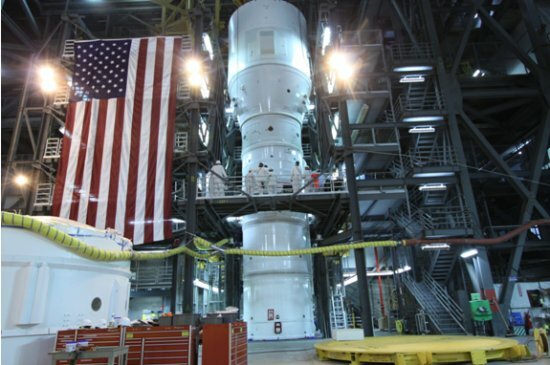 (The Air Force agreed to transfer the axial engines NASA needed as well as the engines’ propellant and pressurization tanks, “for just the cost of shipping,” as RoCS team leader Ron Unger put it.). What a fantastic use of these components: instead of being used for their original mission as part of a nuclear weapon, they are contributing to the first step in America’s next generation of space exploration!